It is a very good movie!! When a shipwreck leaves Alec (Kelly Reno) a courageous young boy and the Black wild Arabian stallion stranded on a desolate island, the two share a frightening adventure of survival that forges a lasting bond of friendship between them. Upon their rescue, Alec and the magnificent horse continue their adventures when they join forces with ex-jockey and horse trainer Henry Dailey (Mickey Rooney). Recognizing the winning combination of The Black's remarkable spirit and Alec's unwavering devotion to his friend, Dailey takes both under his wing and prepares them to go head to head with the world's best thoroughbreds in "the race of the century." It wasn't awesome but I would recommend it. I got this movie for Christmas. It is a good continuation of the first movie and it follows the book well. I personally prefer the first movie better, though. Still, good movie. I absolutely LOVE the book and movie! I LOVE RACING and The Black! A great story. seriously. This movie rocks! It's a lot like the book. The horse who plays the black stallion has a lot of training-in acting and racing. Watch it! I LOVED this movie!!! most awesome ever! Did you know there is 30 minutes of film where no one is talking? It's just a boy and his horse, stranded on a desert island... 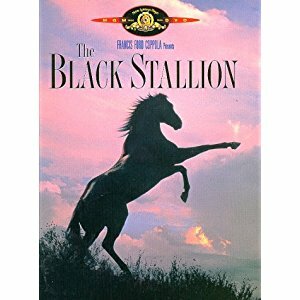 I wish the creators of this one and The Black Stallion Returns would make another, such as The Black Stallion and Satan book. Or the Black Stallion's Ghost. Also a Must-read, COOLEST EVER!! I loved this movie!! My mom has watched this movie hundreds of times since she was a young age of 11. I thought it really expressed the bond between a human and horse. Watch it!! This movie is about a boy named Alec and his partner in life the black. This horse will fight anyone unwise to approach him. This movie tells about all their adventures, a great family move! My class read this book and we were going to watch the movie. I was all excited at first, but once I saw the movie I was sooo bored. My advice, just stick with reading the book, trust me it's better. It was a great story line, very inspiring. But there was pretty much no talking!!!!!! Especially at the start. It is a great movie but i think the book is a tiny bit better. The ending: The black Arab wins the race and all is good. I MEAN IT! The black stallion is better than my friend flicka, Black beauty, Misty and others i love it!!! i do not want to spoil the movie for ya! find out yourself!!! It is just AWSOME! we own the black stallion and the black stallion returns! This is one of the best horse movies ever. It is a great story with everything -- adventure, love, mystery, suspense. I love it!! !